The annual Diocesan Novena of Prayer for the Cause of Canonisation of Blessed Dominic Barberi begins on Wednesday March 20 and concludes on Friday March 29.
listen to our humble request. to know and to invoke the help of this faithful servant of the Church. This we ask through Christ Our Lord. Amen. Mary, Mother of Holy Hope: pray for us. Blessed Dominic Barberi: pray for us. Blessed John Henry Newman: pray for us. and made him a powerful minister of your mercy, listen to our humble request. the help of this faithful servant of the Church. Archbishop Bernard Longley is inviting the Archdiocese to a Novena of Prayer for the Canonisation of Blessed Domenic Barberi. The Novena is to begin on Friday 26th February and concluding on Saturday 5 March when the Archbishop will be celebrating a Mass for Blessed Dominic’s Canonisation at the Passionist Basilica of St John and St Paul in Rome. of this faithful servant of the Church. We ask this through Christ Our Lord Amen. Mary, Mother of Mercy: pray for us. Blessed Dominic and Venerable Catherine McCauley (founder of the Sisters of Mercy) are co-patrons of the Year of Mercy in the Archdiocese. The image of the prayer card showing Bd. John Henry Newman and Bd. Dominic Barberi mentioned by the Archbishop is shown below, as is an image and prayer of Ven. Catherine McCauley. You chose Dominic as a minister of your love. pardon and peace in the unity of your Church. and so gain an eternal reward. His ministry is recorded in a brief note in a parish register of c1929, itself quoting from a programme for Erdington Abbey’s 1909 Parish Bazaar. The little chapel of St Nicholas, in Boldmere Road, Wylde Green, near to Sutton Park, owes its existence to the illustrious Nicholas Cardinal Wiseman, the first Archbishop of Westminster who built it in the year 1840 when President of St. Mary’s College, Oscott, in honour of his patron saint, from designs of the great Gothic architect A. Welby Pugin. Apart from the interest attaching to its foundation, the chapel will ever be held sacred to the English Catholics through its connection with the Venerable Fr Dominic, the saintly Italian Passionist, who received Cardinal Newman into the Church. During his residence at Oscott College, where he was earning the English language, Fr Dominic several times celebrated Holy Mass here, so did Cardinal Newman. For more of the parish history please click here. Blessed Dominic, pray for us. 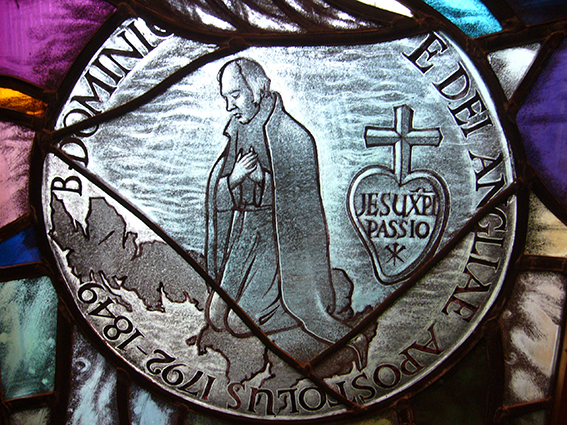 Image of B. Dominic is from a window of the former Passionist Convent at Daventry, and was sourced here.